The first time I ate this salad was at Il Buco on my New York trip, and my life was never the same again. Ok, that might be a slight exaggeration, but I will say that after my husband and I got back to California, I craved Il Buco’s Tuscan Kale Salad non-stop. Fortunately for me (and my wallet—flights back and forth to NYC for salad don’t quite fit into my schedule and or budget), my friend Leslie informed me that the recipe was actually featured at one point in The New York Times. One quick Google search, and voila…a new salad was joyfully welcomed into my repertoire. But this is no ordinary salad. Kale on its own has a hearty flavor, but add a warm lemon and garlic dressing with crumbly, almost tangy cheese? Talk about simple, satisfying, and oh, so delicious. I like to serve it with roasted chicken, or on it’s own as a first course. Just be careful with fish; the salad can be a little overpowering for its delicate flavor. Because you dress it in advance, this salad is a great dish for a potluck. The dressing has time to penetrate the tougher leaves while still keeping the crunch of the fresh kale. Basically, it is the perfect little black dress of salads. It goes with almost everything, it’s memorable, and just classically good. The funny thing is, Tuscan Kale was one of the first things I grew in my vegetable garden. After a few uneven harvests, though, I didn’t re-plant and everything went in the compost pile—what a shame! After I discovered this salad, it’s back in. Really, I don’t know why I ever let it go. Kale grows beautifully and is good in so many things (including this salad). I found the starter plants locally at Terra Sol Garden Center, and after only 6 weeks, they’re doing remarkably well. Tuscan Kale is also known as Black Kale or Dinosaur Kale. The New York Times recipe wasn’t exactly how I remembered the salad at the restaurant, so I modified the lemon and garlic amounts, and used a baguette for the breadcrumbs instead of a slice of country bread. I also used a Molcajete instead of a mortar and pestle (similar, but not totally the same) for the dressing. Wash and dry your kale. Trim bottom 2 inches off kale stems and discard. Slice kale, including ribs, into 3/4-inch-wide ribbons. You should have 4 to 5 cups. Place kale in a large bowl. Toast the bread until golden on both sides. Slice into thin slices one way, then turn it and slice the other way to make cubes. Then, chop your cubes into small, minced-like pieces to make breadcrumbs. You can also do this in a food processor, but I find the thing such a pain to clean, I try to avoid using it whenever possible. Plus, this way gives you bigger fluffier crumbs anyway. 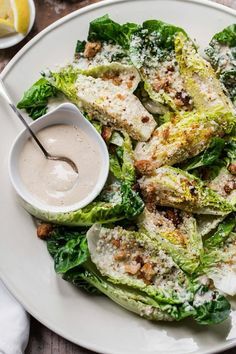 You will use most of the breadcrumbs tossed in the salad, but reserve some for garnish. Using a mortar and pestle (or molcajete), add lemon zest, red pepper flakes, and the clove of garlic. pound everything into a paste. Next, add 3 tablespoons of oil, juice, salt , black pepper, and 1/4 cup cheese. Whisk to combine (I did this all in the bowl of the molcajete). Pour the dressing over the kale and toss very well to thoroughly combine. The dressing will be thick and will need lots of tossing to evenly coat the leaves. Let salad sit for 5 minutes (I let it sit for 30 minutes at our Easter buffet and it was still delicious) toss in breadcrumbs and pile the salad high on the plate. Add additional cheese, more breadcrumbs, and a drizzle of oil for garnish. Yum! This sounds divine–can’t wait to try it! Thank you for posting this recipe! I just got back from NYC and had the Black Kale Salad at Il Buco and am trying to replicate it tonight. Looks like the New York Times page is no longer live. Love your site and looking forward to the salad! This looks delicious! I will definitely be making this for Jason tonight!!! And a great idea for Thanksgiving! Love it! Hope you enjoy this salad tonight, I think it’ll make a great addition to your Thanksgiving menu. Could you plz mention the calorie count per serving n the no. Of serings this recipe makes.